Tajiks (Persian: تاجيک Tājīk) are a Persian-speaking people who are mostly found in what is now Tajikistan, including in parts of Afghanistan, Uzbekistan and China. After the Soviet invasion of Afghanistan in 1979, some Tajik refugees escaped to live in neighboring Iran and Pakistan. Most Tajiks are Sunni Muslims, but a few in remote mountain areas follow Shia Islam. The name Tajik being used for this group of people began in the early 20th century by the Russians. Before that, they were called Sarts. The name Tajik refers to the traditionally sedentary people who speak a form of Persian language called Tajiki in Tajikistan and Uzbekistan, and who speak today's Dari language in Afghanistan. It is generally accepted that the origin of the word Tajik is Middle Persian Tāzīk "Arab" (New Persian: Tazi), or an Iranian (Sogdian or Parthian) cognate word. Some Turks of Central Asia adopted a variant of this word, Täžik, to designate the Persian Muslims in the Oxus basin and Khorasan, who were the Turks' rivals. Historians believe that some Tajiks may be connected to ancient Aryans who lived in the region for thousands of years. They were the heirs and transmitters of the Central Asian sedentary culture that diffused in prehistoric times from the Iranian plateau into an area extending roughly from the Caspian Sea to the borders of China. The Aryans constituted the core of the ancient population of Khwarezm, Sogdiana and Bactria, which formed part of Transoxania. They were included in the empires of Persia and Alexander the Great, and they mixed with later invaders like the Mauryans, Kushans and Hepthalites. Over the course of time, the language that was used by these ancient people eventually gave way to Farsi, a western dialect spoken in Iran, Afghanistan and Tajikistan. In the 13th century, Genghis Khan and his Mongol army settled in many of the popular Persian cities after whiping out the Persian population. These Mongols later adopted the Persian language and the religion of Islam. Tajiks usually reject Mongol origin and claim to be ancient Persians but this is difficult to prove. ↑ This figure only includes Tajiks from Afghanistan. 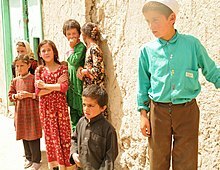 The population of people from Afghanistan the United States is estimated as 80,414 (2005). United States Census Bureau. "US demographic census". Retrieved 2008-01-23. Of this number, approximately 65% are Tajiks according to a group of American researchers (Barbara Robson, Juliene Lipson, Farid Younos, Mariam Mehdi). Robson, Barbara and Lipson, Juliene (2002) "Chapter 5(B)- The People: The Tajiks and Other Dari-Speaking Groups" Archived 2010-01-27 at the Wayback Machine The Afghans – their history and culture Cultural Orientation Resource Center, Center for Applied Linguistics, Washington, D.C., OCLC 56081073. ↑ "Ethnic composition of the population in Kyrgyzstan 1999–2007" (PDF). Retrieved 2012-06-11. ↑ United Nations High Commissioner for Refugees (2002-10-01). "Long-time Tajik refugees return home from Pakistan". UNHCR. Retrieved 2012-06-11. ↑ Oxford English Dictionary: Origin of the word "Tajik": from Persian Tājik 'a Persian, someone who is neither an Arab nor a Turk'. This page was last changed on 8 September 2018, at 18:09.